We met both Carmens featured in our book 'Islands of Cats' at the C.S.A.F. [Carers for Stray and Abandoned Felines] Sanctuary in Cospicua, as they were busy helping to care for the 250+ stray cats that live there. We were proud to present these two deserving stray cat carers with their copy of ‘Islands of Cats', and they were as pleased to receive them! Besides their volunteer work at the CSAF, the two ladies also take care of their own cat colonies. You can read more about these dedicated women in 'Islands of Cats' on pages 17-19 for Carmen in Pietà, and pages 75-77 for Carmen in Kalkara. 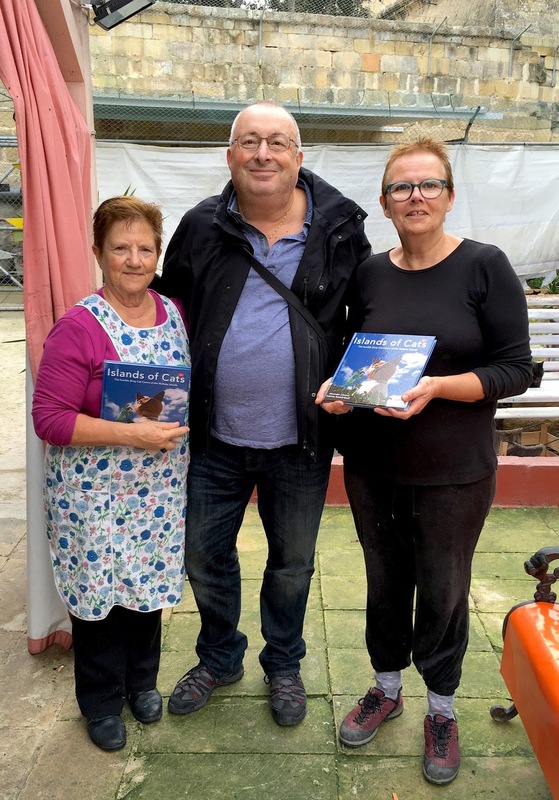 'Islands of Cats' tells the stories of a representative 22 of over 1,000 stray cat carers in Malta and Gozo on 128 pages, illustrated by over 250 colourful photographs - accompanied by cat facts, stories, interviews, and it introduces places of interest on the Islands. 'Islands of Cats' is available in English, Maltese and German, as well as E-Books and Amazon Kindle. And most of all, we donate part of the proceeds of each book sold in aid of neutering and spaying of stray and abandoned cats in the Maltese Islands. Click here to order your copy, and please tell your friends.